Bulgari gemstone rings are brightly colored. For many couples, designer engagement rings are either too predictable because they conform to popular and somewhat cliché styles, or they are too extreme and only focus on outrageous designs - not so with Bulgari engagement rings. 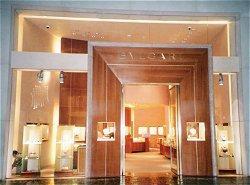 Since 1884, the name Bulgari (Bvlgari) has been synonymous with fine Italian designs and exquisite jewelry. This luxury brand has expanded from its flagship store in Rome to more than 190 stores in dozens of nations around the world, bringing superior design and an enchanting blend of classic and contemporary trends to interested couples everywhere. Bulgari is also known for its fine watches, designer silk scarves, and expressive eyewear, but no pieces are more elegant than their engagement rings. Pave setting engagement rings with either wide or narrow bands to complement different sizes of center stones. Flower engagement rings with smooth metal detailing that hints at the floral influence instead of creating an obvious facsimile. Accented rings with either round or baguette channel settings to complement focal stones. The exclusive Marryme diamond solitaire engagement rings that cleverly combine both prong and tension settings in a sleek modern design. Within the different Bulgari ring collections, various diamond shapes are used, including round, emerald, oval, and pear shapes. While the classic prong tiffany settings are the most popular, many rings feature channel-set accents and several rings also use bezel settings. Different precious metals are also used, including platinum, white gold, and yellow gold, though a limited number of designs also use rose gold. While all the rings in the Bulgari bridal collections solely feature diamonds, couples interested in gemstone engagement rings can find many startlingly unique options in Bulgari's other lines. Brilliant multi-colored designs use several different semi-precious gemstones on a single ring, often mixing sizes and shapes for a tremendously unique appeal. 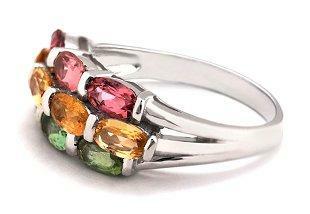 Peridot, sapphires, pink tourmaline, topaz, and several shades of quartz are popular gemstone choices. These eclectic styles would make stunning art deco engagement rings as well as right hand fashion rings. Most brides wear more than a ring on their wedding day, and choosing coordinating jewelry adds refinement and sophistication to any bride's ensemble. Bulgari offers not only a wide range of engagement rings, but also has extensive collections of diamond necklaces, diamond pendants, diamond earrings, and diamond tennis bracelets available. Of course, the most important piece of coordinating diamond jewelry is the wedding ring. Bulgari engagement rings can easily be paired with their matching designer wedding bands, many of which feature scatter set diamonds or unique designs, such as the unusual octagonal band or curved styles that coordinate with the designer's engagement rings. With particular attention to sleek, contemporary styles, Bulgari engagement rings are widely known for their high quality. All diamonds used in Bulgari designs are colorless and are independently evaluated by the Gemological Institute of America, making all of them GIA certified diamonds. While the carat weight will fluctuate (Bulgari insists on choosing high quality stones rather than simply large ones), every gem meets strict quality and beauty standards, guaranteeing that it creates a stunning piece of jewelry. Socially conscious consumers will also be pleased to note that Bulgari participates fully in the Kimberley Process to halt the trade of illicit conflict diamonds, and the company conducts regular audits of its records to ensure that their reputation for quality and integrity remains as unblemished as the stones they use. Bulgari engagement rings are available from many fine jewelers who routinely offer designer engagement rings. For more information about where to find Bulgari styles and how to locate a suitable retailer, visit the official website, Bulgari.com. Couples interested in a sleek, contemporary style with uncompromising quality and elegance need look no further than Bulgari engagement rings. These designer creations are sophisticated yet mystical, offering all the intrigue and romance of a classic engagement ring with a unique modern twist.